As I mentioned previously, I'll be attending the Stampin' Up convention at the end of the month and I was lucky to join a mini album swap. I know my customers (and me) really love mini albums and books. 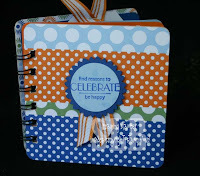 It's a great way to scrapbook a small event or give a gift to a grandparent or teacher. I know when I go to convention I always take a lot of pictures with friends, some who I only see once or twice a year and so I thought this would be a great place to put those special pictures as we help Stampin' Up! celebrate 20 great years! This book is made with chipboard coasters (like the kind you get at your favorite resturant). All materials are from Stampin' Up! with the exception of the coasters and the binding. I used the Bind-It-All machine to bind these little books! Accessories: Scallop punch (used to make medallion on cover), 1 3/8 cicrle, Bashful striped grosgrain, Pumpkin striped grosgrain, Jersey Shore DSP, Large Oval punch, tag corners punch, SU glue sticks, circle colluzle, dimensionals, On Board Chipboard (heart). There are four pages inside with both sides decorated for a total of 8 pages to put pictures, journaling, and momentos. I hope my swap mates enjoy filling these as much as I enjoyed making them! Tomorrow I'll be featuring a quick card that I made for a 10 Minutes to Terrifc card swap!